10 dishes (and drinks) that you MUST TRY in Malaysia! It’s quite a long time i’m not posting any entry in my blog, due to my working schedule (outstation). Sadly, the internet coverage at that place is not so good, eventhough i’m trying to switch the service provider from one to another. Now, I’m back to KL (for a while), and I would like to tell you more about my beloved country, Malaysia! OK. Let’s discover 10 dishes that you must try during your visit to Malaysia! Traditionally, this comes as a platter of food wrapped in banana leaves, with cucumber slices, small fried anchovies (ikan bilis), roasted peanuts, hard boiled egg, and hot spicy sauce (sambal) at its core. 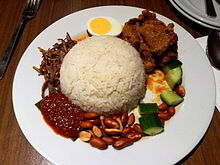 As a more substantial meal, nasi lemak can also come with a variety of other accompaniments such as ayam goreng (fried chicken), sambal sotong (cuttlefish in chilli), cockles, stir fried water convolvulus (kangkong), pickled vegetables (acar), beef rendang (beef stewed in coconut milk and spices) or paru (beef lungs). Traditionally most of these accompaniments are spicy in nature. This is how “Roti Canai” looks like. Served with sambal (spicy sauce), curry and dhal. Roti canai (pronunciation tʃanai) is a type of Indian-influenced flatbread found in Malaysia and Indonesia. It is often sold in Mamak (Indian Muslim) stalls in Malaysia; also in Malay, Minangkabau and Aceh restaurants in Indonesia. It is known as roti prata in Southern Malaysia and Singapore, and is similar to the Indian Kerala porotta. It’s not complete if you ordered your roti canai, without teh tarik. Ask any Malaysian worth his or her salt to name their favourite tea, and most likely it is the teh-tarik. Literally meaning “pull tea”, the drink is prepared using out-stretched hands to pour piping hot tea from a mug into a waiting glass. The higher the pull the thicker the froth. Often found in Indian hawker stalls or restaurants, preparing the teh-tarik is both an art and science. Teh Tarik make in action! In expert hands, the action of streaming tea back and forth the containers is a feast for the eyes. This visual treat involves vigourous almost acrobatic like-movements of the hands and arms, as the tea steadily spills into receiving ends. Poetry in motion. There is a reason behind this unusual method of serving tea. It is believed that the technique of stretching the tea helps it to mix well with another essential ingredient, the condense milk. Thus, bringing out the strong aroma and the subtle taste of tea. Also, the beverage cools faster this way. Style with substance. Satay ( /ˈsæteɪ/, /ˈsɑːteɪ/ sah-tay), or sate, is a dish of marinated, skewered and grilled meat, served with a sauce (normally peanut sauce) .Satay may consist of diced or sliced chicken, goat, mutton, or beef; the more authentic version uses skewers from the midrib of the coconut palm frond, although bamboo skewers are often used. These are grilled or barbecued over a wood or charcoal fire, then served with various spicy seasonings. Cendol ( /ˈtʃɛndɒl/) is a traditional dessert originating from South East Asia which is still popular in Malaysia, Indonesia, Myanmar (where it is known as mont let saung), Singapore, Vietnam, and Thailand. The dessert’s basic ingredients are coconut milk, a worm-like jelly made from rice flour with green food coloring (usually derived from the pandan leaf), shaved ice and palm sugar. Other ingredients such as red beans, glutinous rice, grass jelly, creamed corn, might also be included. Laksa is a popular spicy noodle soup from the Peranakan culture, which is a merger of Chinese and Malay elements found in Malaysia and Singapore, and to a lesser extent, Indonesia. Perlis laksa (Malay: Laksa Perlis) is similar to Penang Laksa but differs in garnishing used such as catfish and eel fish. The famous Perlis laksa can be found in Kuala Perlis. Kedah laksa (Malay: Laksa Kedah) is very similar to Penang laksa and only differs in the garnishing used. Sliced boiled eggs are usually added to the dish. Kedah laksa used rice to make a laksa noodle. The famous laksa in Kedah is Laksa Telok Kechai. Comes from the Malaysian island of Penang. It is made with mackerel (ikan kembung) soup and its main distinguishing feature is the asam or tamarind which gives the soup a sour taste. The fish is poached and then flaked. Other ingredients that give Penang laksa its distinctive flavour include lemongrass, galangal (lengkuas) and chilli. Typical garnishes include mint, pineapple slices, thinly sliced onion, hε-ko, a thick sweet prawn paste and use of torch ginger flower. This, and not ‘curry mee’ is the usual ‘laksa’ one gets in Penang. From Johor state in southern Malaysia, resembles Penang laksa only in the kind of fish used but differs in everything else. Johor laksa has coconut milk, use kerisik, dried prawns, lemon grass, galangal and spices akin to curry. The garnishing comprises slices of onion, beansprouts (taugeh), mint leaves, Vietnamese coriander or ‘daun kesum’, cucumber and pickled white radish. Sambal belacan (a kind of chili paste) is placed on the side. Finally, just before eating, freshly squeezed lime juice is sprinkled on the dish. Unique to Johor laksa is its Italian connection – spaghetti is used instead of the normal rice noodles or vermicelli. Johor laksa is traditionally eaten using the hand and the noodles are usually knitted (cetak) into a disk for each serving. Comes from the Malaysian state Sarawak, on the island of Borneo. It is actually very different from the curry laksa as the soup contains no curry at all. It has a base of Sambal belacan, sour tamarind, garlic, galangal, lemon grass and coconut milk, topped with omelette strips, chicken strips, prawns, fresh coriander and optionally lime. Ingredients such as bean sprouts, (sliced) fried tofu or other seafood are not traditional but are sometimes added. It is the easiest laksa recipe that is famous among peoples from the town of Kota Bharu of the Kelantan state, located at the east coast of Peninsular Malaysia. The main ingredient of Kelantan Laksa’s sauce is ‘ikan kembong’ or round scad mackerel that are boiled and minced. The minced fish are fried with onions, garlic, ginger, datil pepper, belacan (Shrimp paste), ‘kantan’ flower, Vietnamese coriander or ‘daun kesum’, lemon grass and dried tamarind slice. Coconut milk will then be added as the final ingredient and stirred until it is all mixed up and becomes thick. Kelantan Laksa is served just like the Italian spaghetti by adding ‘ulam’ (raw vegetables) and blended chili on the side. Another variable of Kelantan Laksa is ‘Laksam’. The sauce’s recipe are exactly the same but the noodles are a bit bigger and flat. Char kway teow, literally “stir-fried ricecake strips”, is a popular noodle dish in Malaysia, Indonesia, Brunei and Singapore. The dish was (and still is in some places in Malaysia and Singapore) typically prepared at hawker stalls. It is made from flat rice noodles (河粉 hé fěn in Chinese) of approximately 1 cm or (in the north of Malaysia) about 0.5 cm in width, stir-fried over very high heat with light and dark soy sauce, chilli, a small quantity of belachan, whole prawns, deshelled cockles, bean sprouts and chopped Chinese chives. The dish may commonly be stir-fried with egg, slices of Chinese sausage and fishcake, and less commonly with other ingredients. Rojak, in Malay means Mix. As its named, rojak is a mixture of fruits (sweet and sour fruits) and poured with spicy gravy (dressing). The dressing is made up of water, belacan (shrimp paste), sugar, chili, and lime juice. Ingredients vary among vendors with some also using hae ko prawn/shrimp paste, tamarind or black bean paste in the mix. Also known as rojak, since it is also a mixture of several ingredient, such as fried dough fritters, bean curds, boiled potatoes, prawn fritters, hard boiled eggs, bean sprouts, cuttlefish and cucumber mixed with a sweet thick, spicy peanut sauce. Traditionally, Indian Muslim (Mamak) rojak vendors used modified sidecar motorcycles as preparation counters and to peddle their rojak. These mobile vendors now use modified mini trucks. The Pasembor available in Singapore is an assortment of potatoes, eggs, bean curd (tofu), and prawns fried in batter, served with a sweet and spicy chili sauce. In Penang, where it is a local favourite, it is always called pasembor, but in Kuala Lumpur and Singapore it is called rojak. It’s like a snow ball, poured with syrup and sweetened milk (jusk joking). Formerly, it was made of only shaved ice and red beans, though the number and diversity of ingredients has since expanded.Today, ais kacang generally comes in bright colours, and with different fruit cocktails and dressings. In Malaysia, almost all variants now contain a large serving of attap chee (palm seed), red beans, sweet corn, grass jelly and cubes of agar agar as common ingredients. Other less-common ingredients include aloe vera, cendol, nata de coco, or ice cream. A final topping of evaporated milk, condensed milk, or coconut milk is drizzled over the mountain of ice along with red rose syrup and sarsi syrup. Some stalls have even introduced novelty toppings such as durian, chocolate syrup and ice cream. There are also versions that shun the multi-coloured syrup and are served with just a drizzling of gula melaka syrup instead. Many Southeast Asian coffee shops, hawker centres, and food courts offer this dessert. Nowadays, ais kacang is mostly known as ‘ABC’ (acronym for Air Batu Campur, literally meaning “mixed Ice”). OK! That’s 10 famous dishes that you can try in Malaysia. There are more, actually, maybe in the next entry. It’s my first time to write in English in my blog =)! 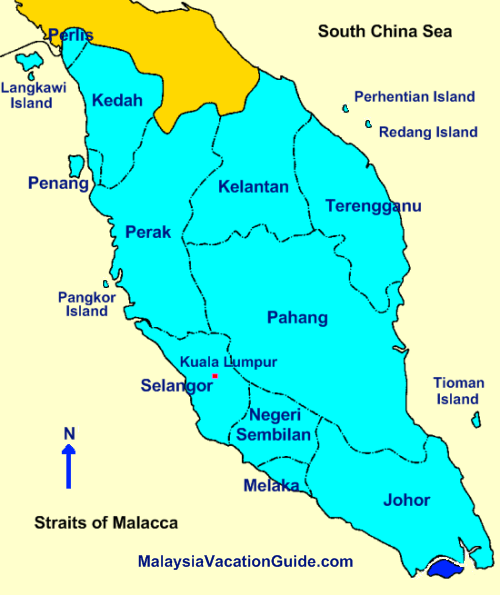 I guess, a lot of you know Malaysia well, but a lot of you also didn’t know or even never heard about Malaysia before isnt it? Never mind, both of you will benefit from my post below! 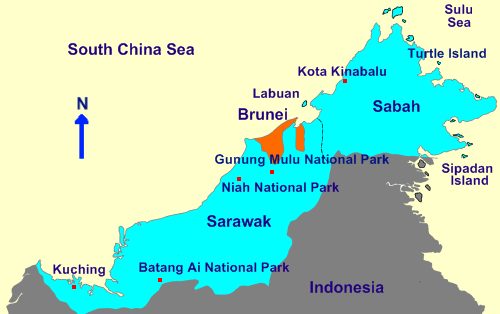 Located in South East Asia (SEA) region with total landmass of 329,847 square kilometres (127,350 sq mi) separated by the South China Sea into two similarly sized regions, Peninsular Malaysia (West Malaysia) and Malaysian Borneo (East Malaysia). 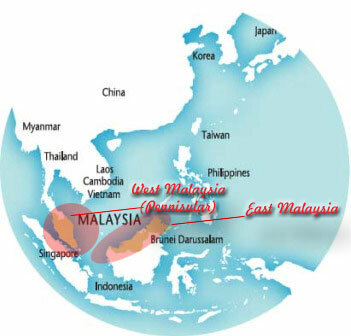 There is where Malaysia located in the world map! Each state have their own places of interest for you to visit! And….have their own unique culture, languages, etc. I’ll continue to tell you more in my next post! Stay tuned folks!